This article appeared in symmetry on July 23, 2013. Twice a year, Todd Johnson drives 400 miles from the Fermilab campus in Illinois to a commercial polymer crosslinking facility in Ohio, which is generally used to prepare plastic tubing for uses like heating systems in houses. Johnson is there for its linear accelerator, something with which he is quite familiar, given his day job working in Fermilab’s Accelerator Division. But on these two days a year, Johnson is not using the accelerator for science—although there is a lot of science involved. 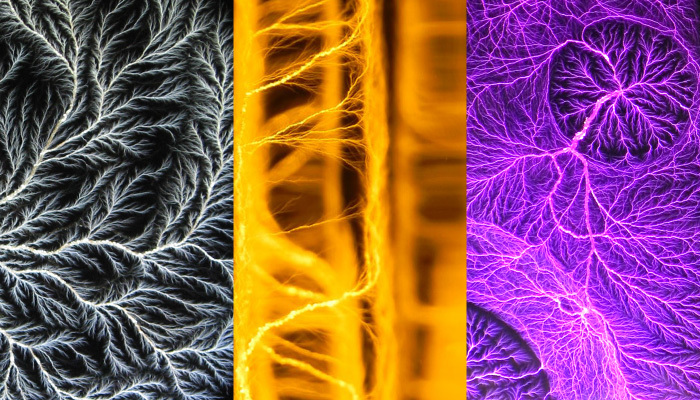 Johnson is making Lichtenberg figures, fractal patterns that result from the lightning-bolt-like movements of excited electrons. The hobby is a popular one among accelerator scientists, but Johnson says he and the friends he works with are working to explore the limits of the process. Every six months, Johnson arrives at the facility with stencils laser-cut from steel or handmade from sheet lead; clear acrylic hunks of varying sizes; and a lot of ideas. He sends his pieces of acrylic through the accelerator’s electron beam, which is designed to break chemical bonds in plastics. Because acrylic is an insulating material, the beam scatters through the material, losing momentum as it goes. Only areas of the acrylic not covered by a stencil are exposed to the beam, allowing Johnson to create shapes. Eventually the beam coalesces into a pool of electrons that desperately want to escape but can’t—an invisible puddle of potential energy. Releasing that energy is a simple but arresting process. To do it, Johnson uses a hand-made tool reminiscent of a crude, oversized syringe. It works like a click pen—press on one end and the tip comes out the other with enough force to puncture the acrylic. The instant the tool punctures the surface, there’s a burst of white light as the pool of excited electrons escapes from the material, leaving trails of vaporized acrylic in its place. On their way out of the acrylic, the electrons follow the same natural laws that govern all systems that flow—electricity snaking its way from a storm cloud to Earth, rivers branching into ever smaller creeks and streams, or the spidery web of veins that distributes blood throughout your body. Johnson used this property to his advantage when the husband of a pulmonologist contacted him to request a gift for his wife. He used his stencils to create the shape of a pair of lungs filled with electron trails that formed a lifelike system of capillaries. Johnson, who has worked at Fermilab for three decades, first found out about Lichtenberg figures through a friend at the lab who builds Tesla coils. But the figures weren’t his first foray into the art world. In the 1990s, Johnson was interested in holography and built equipment in his basement to make three-dimensional photographs. Johnson says he considers his current creative process vastly different from what most artists get to experience: bursts of inspiration, hours of freewheeling improvisation, the luxury of time. Instead, Johnson spends six months conceptualizing and preparing materials, all for the two days per year on which he can see his ideas come to fruition. See more images of Johnson’s work in symmetry.